I don’t know whose children these are, but I think I speak for everyone when I say that I want to high 5 each and every one of them and then high 5 each of their parents for raising such awesome children! This morning, video surfaced of a group of small children at what looks like a school talent show, performing Iron Maiden’s “Ghost of The Navigator,” which is awesome all on its own; when you take a closer look and realize that the kids are actually recreating an Iron Maiden concert, complete with costumes, instruments, a little ego box for mini Bruce Dickinson to jump on and off of that reads “Iron Maiden” in bold red letters and even facial hair drawn on by someone’s fiercely dedicated parent, you’ve got yourself the perfect recipe for the most adorable video you’ll see all day. Fun Fact: The lyrics to “Ghost of the Navigator” is a metaphor of life. 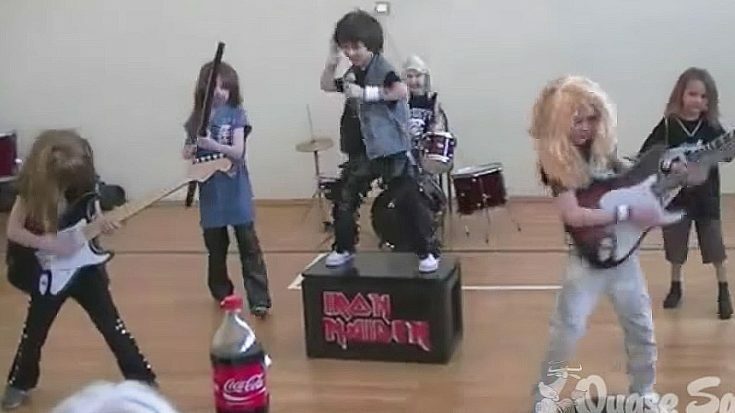 These kids have Iron Maiden’s stage presence down to an art! Mini guitarists Dave Murray, Janick Gers and Adrian Smith orbit fearlessly around mini Steve Harris and Bruce Dickinson, while mini Nicko McBrain holds it down from behind his kit, a constant force in the chaos going on in front of him. Guys, this is just too damned cute for words – if there were an award for coolest elementary school talent show, this school would win it!